Everard DIGBY Esquire (1440-1510) was Alex’s 16th Great Grandfather; in the Miner line. Everard DIGBY Esquire was born 1440 in Stoke Dry, Rutland, England. His parents were Everard “Greenleaf” DIGBY and Agnes CLARKE. He married 1463 in Stoke Dry, Rutland, England to Jacquetta ELLIS Everard died Feb 1510 in Tilton, Stoke Dry, Rutland, England. Jacquetta ELLIS was born 1445 in Combe Raleigh, Devon, England. Her parents were Sir John ELLIS (1430 in Devon) and Eleanor RUSSELL (b: 1432). 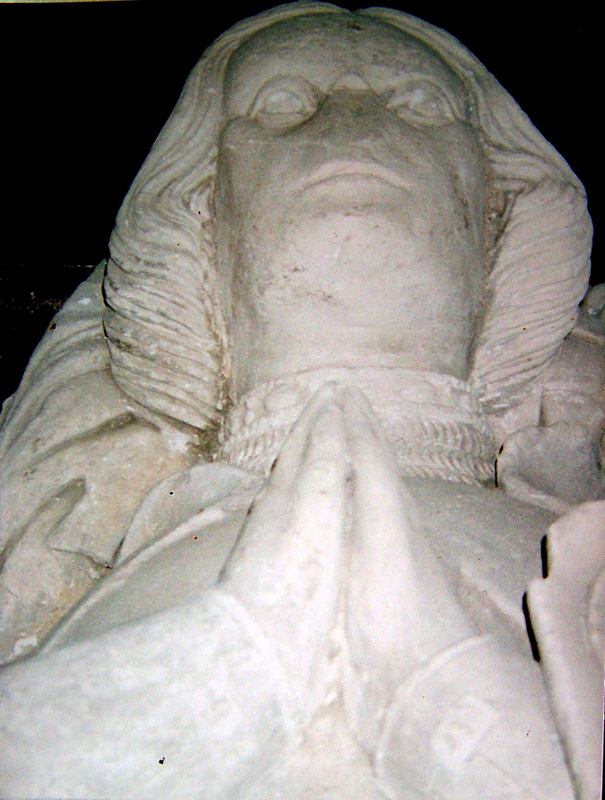 She died 1483 in Stoke Dry, Rutland, England. Coleshill, Warwickshire, England. Sir John Villiers K.B. 8. 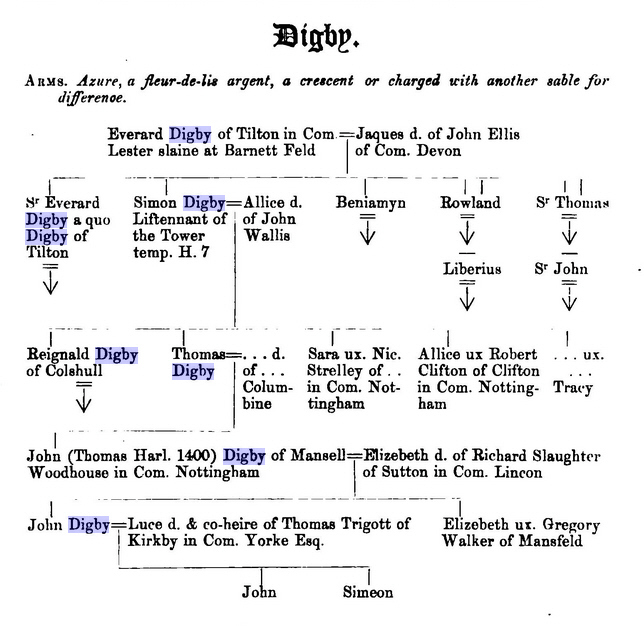 Benjamin Digby 1479 in Stoke Dry, Rutland, England. Everard and his six brothers fought for Henry VII at the battle of Bosworth 22 August 1485. This time, the Digbys were on the winning side. 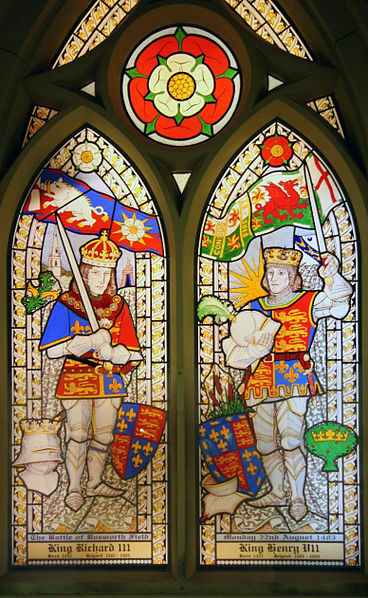 A stained-glass window in St. James Church, Sutton Cheney, commemorates the Battle of Bosworth Field and the leaders of the combatants, Richard III (left) and Henry VII (right). Richard’s reign began in 1483 when he seized the throne from his twelve-year-old nephew Edward V. The boy and his younger brother soon disappeared, to the distress of many, and Richard’s support was further eroded by rumours of his involvement in the death of his wife. Across the English Channel Henry Tudor, a descendant of the greatly diminished House of Lancaster, seized on Richard’s difficulties and laid claim to the throne. Henry’s first attempt to invade England in 1483 was frustrated by a storm, but his second arrived unopposed on 1 August 1485 on the southwest coast of Wales. Marching inland, Henry gathered support as he made for London. Richard hurriedly mustered his troops and intercepted Henry’s army south of the town of Market Bosworth in Leicestershire. Lord Thomas Stanley and Sir William Stanley also brought a force to the battlefield, but held back while they decided which side it would be more advantageous to support. Richard divided his army, which outnumbered Henry’s, into three groups (or “battles”). One was assigned to the Duke of Norfolk and another to the Earl of Northumberland. Henry kept most of his force together and placed it under the command of the experienced Earl of Oxford. Richard’s vanguard, commanded by Norfolk, attacked but struggled against Oxford’s men, and some of Norfolk’s troops fled the field. Northumberland took no action when signalled to assist his king, so Richard decided to gamble everything on a charge across the battlefield to kill Henry and end the fight. Seeing the king’s knights separated from his army, the Stanleys intervened; Sir William led his men to Henry’s aid, surrounding and killing Richard. After the battle, Henry was crowned king on Crown Hill. Henry hired chroniclers to portray his reign favourably; the Battle of Bosworth Field was popularised to represent his Tudor dynasty as the start of a new age. From the 15th to 18th centuries the battle was glamorised as a victory of good over evil, and as the climax of Shakespeare’s Richard III about Richard’s rise and fall, it provides a focal point for critics in later film adaptations. The exact site of the battle is disputed because of the lack of conclusive data, and memorials have been erected at different locations. The Bosworth Battlefield Heritage Centre was built, in 1974, on a site chosen based on a theory that has been challenged by several scholars and historians in the following years. In October 2009, a team of researchers, who had performed geological surveys and archaeological digs in the area from 2003, suggested a location two miles southwest of Ambion Hill. Sir Simon’s wife Alice Walleys was born 1472 in Haddon, Devon, England. Simon was Constable of Coleshill, in Warwickshire in the 15th century. Simon de Montford was executed in 1495 for contributing to the fund of Perkin Warbeck, who was plotting to oust King Henry VII from the throne. During de Montford’s imprisonment in the Tower of London, the King granted his lands at Coleshill to Simon Digby as he was Constable. Descendants of Simon Digby (Wingfield-Digby) still hold the titles. The oldest Digby tomb in Colehsill church, in the north-east corner, is to Simon Digby, died 27 February 1519 (1520), and Alice his wife (date not completed). 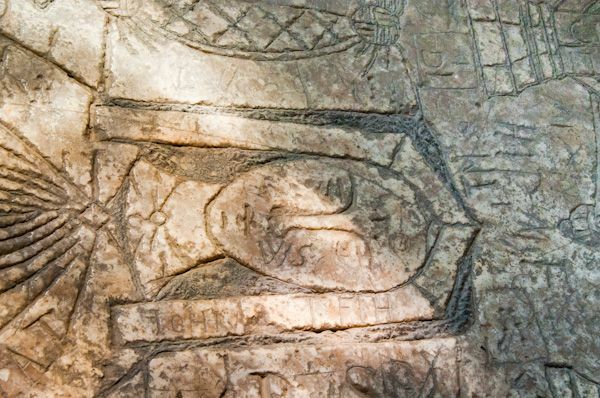 The tomb and effigies are of alabaster. The man’s head rests on his helm, which has lost its crest. He wears full plate and mail armour of the period and a collar of S.S., a sword on his left, and the remains of his dagger on his right. His hands are in prayer; the gauntlets lie by his right leg. His feet rest against a lion. The woman, on his left, has her head resting on cushions with tiny angels, now headless, holding the corner tassels. She wears a veiled pedimental headdress, a chain necklace, a tight corsage below a sideless gown which has a full skirt. About her waist is a girdle with tasselled pendant cords and a medallion from which is suspended a chain and pomander sachet. At her feet are two tiny dogs. The sides of the tomb are panelled with foiled diamonds in squares enclosing shields. At the angles are twisted shafts painted black. The capping is moulded and has a frieze on which is carved the inscription in Latin. The moulded plinth is enriched with flower or foliage paterae. The shields are painted with the arms of Digby and Walleys. Simon died in 1520 Coleshill, Warwickshire, England and is buried in a tomb, made in his lifetime, bearing superb effigies of himself and his wife, in the sanctuary of Coleshill Church. Alice Walleys was born 1472 in Haddon, Devon, England. Every day in the year immediately after the Sacring of the High Mass in the Church of Colshill, and at the end of the same Altar, where the said Mass should so happen to be sung, to a Child, viz. male or female, whose parents are Householders dwelling within the Parish, and under the age of ix (9) years, that can and will, before the said sacring kneel down at the said Altar’s end, and say five Pater nosters (Our Fathers), five Aves (Hail Marys) and a Creede, for the soul of Simon Digby her late husband, hers, her Childrens’ and all Christen souls, a peny of silver sterling; beginning first at the House next to the Church, and so in order passing on from House to House till all be gone through: and to the Dean of the said Church, for the time being, yearly for his labour and diligence in seeing the said Prayers so performed; and himself also saying at the said time a Pater noster, an Ave, and a Creed for the souls abovesaid, the yearly summe of vis. Viiid (8 pence). 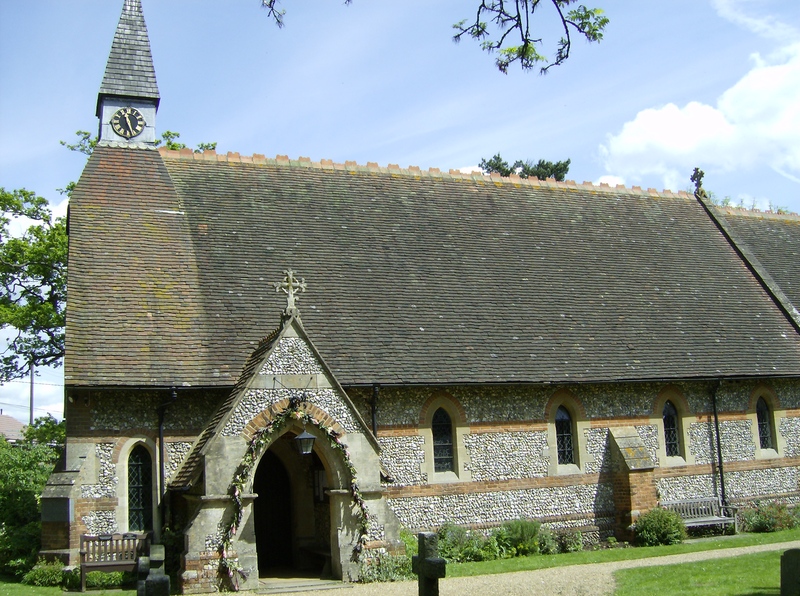 And that the remainder shall be to maintain a solemn Obit in the said Church, for the souls abovesaid, with the number of three Priests, whereof the Vicar of Colshill to be one, and the Deacon and the Clerke besides; the said Vicar, in case he be present, to have viiid (8 pence). and to xii (12) poor people, the same time kneeling about the Herse and saying our Ladies Psalter, xiid (12 pence). To the Bell-ringers vd (5 pence). For Waxe and Torches, burnt then likewise, xiid (12 pence). At the Reformation the land and revenues given to maintain the charity were confiscated, but the townspeople acquired the income to maintain the Grammar School and also made a distribution to a child that should come to the church at 10 each morning and repeat the Lord’s Prayer before the clerk, who for hearing the child and ringing the bell had a yearly allowance. Agnes’ husband Sir John Villiers K.B. was born 1462 in Brooksby, Leicestershire, England. His parents were John Villiers and Elizabeth Sothill. He died 2 Dec 1506 in Brooksby, Leicestershire, England. Sir John was sheriff of Leicestershire and Warwickshire during 6, 10 and 15 of Henry VII and afterwards knighted at the marriage of Prince Arthur, the king’s son. Sir Everard’s wife Margery Heydon was born 1493 in Baconsthorpe, Norfolk, England. Her parents were Sir John Heydon K.B and Katherine Willoughby. Everard and Margery’s son Kenelm Digby (Wiki) (c1518–1590) was an English MP and High Sheriff. He was born in Stoke Dry in Rutland, the eldest son of Sir Everard Digby and Margery (née Heydon) Digby and educated at Brasenose College, Oxford and the Middle Temple. He should not be confused with Sir Kenelm Digby (1603–1665), also son of a Sir Everard Digby (executed for taking part in the Gunpowder Plot), of Buckinghamshire. He was first elected to parliament as MP for Stamford in 1539. He was then appointed High Sheriff of Rutland in 1541. He was returned as MP for Rutland (as senior knight of the shire) in successive parliamentary elections in 1545, 1547, 1553 (March) and 1553 (October), 1555, 1558, 1559, 1571, 1572 and 1584. He was also appointed High Sheriff of Rutland a further six times in 1549, 1553, 1561, 1567, 1575 and 1585. 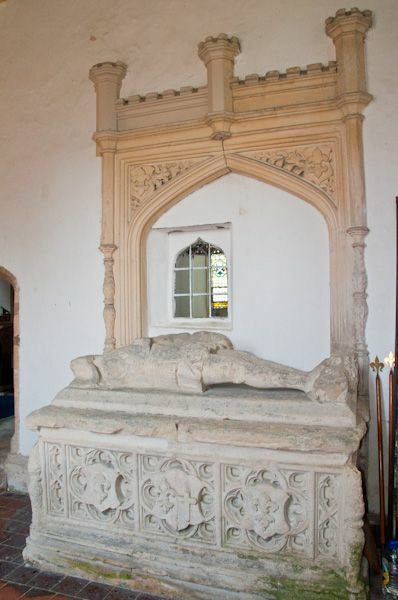 He was custos rotulorum for Rutland from c.1559 until his death. He died in 1590 at the age of 70 plus and was buried in the church at Stoke Dry where his effigy lies. He had married Anna Cope, the daughter of Sir Anthony Cope; they had three sons and six daughters. This entry was posted in Artistic Representation, Line - Miner, Storied and tagged 18th Generation. Bookmark the permalink.